Sadly, all good things must come to an end. We here at Cheryl’s hope you had a blast trying out our many buttercream experiments over the past seven weeks, but now it’s time for the grand finale! 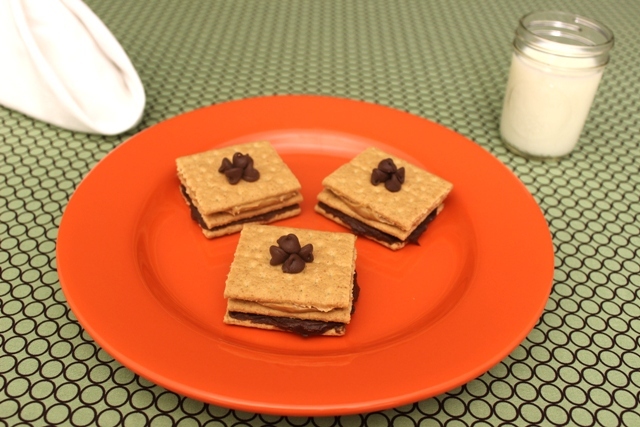 To wrap things up, we thought we’d put a new twist on an old campfire favorite: S’mores. But there’s no need to light up a bonfire for this delicious treat. All you need is a few graham crackers, a tub of Cheryl’s rich fudge buttercream icing (to replace the chocolate bar in the traditional S’mores recipe) and a jar of creamy peanut butter (to stand in for the marshmallows). So let’s get crackin’! Break the graham crackers into small squares and separate them into three equal piles. Take one pile and spread a thick layer of Cheryl’s fudge buttercream frosting onto each graham cracker. For the second pile, spread a thick layer of peanut butter onto each square. Leave the remaining squares unfrosted. Lay the buttercream-frosted crackers on a plate, frosted side up. Stack one plain cracker on top of each buttercream-frosted square, and then stack a peanut butter–covered cracker on top of the plain cracker to create a three-layer sandwich. Cap off the sandwich with a topping of your choice, like chocolate chips or strawberry slices. Now gather your friends ’round the table, pour yourselves a few mugs of piping hot chocolate, and take joy in a night of warm laughter and sweet comfort! That’s all, folks! Before the curtain officially closes on our buttercream series, tell us which yummy project you loved most: traditional treats, icing fondue, deconstructed cake, cake push-up pops, frosted pancake sandwiches, frosted doughnut flowers, or frosted graham stackers?